AERO 26 is the featuring model of the AERO series with high focus on application and end-user needs. Push&Clean filter cleaning system and exhaust air blow function is found on all models together with flexible and convenient accessory storage. 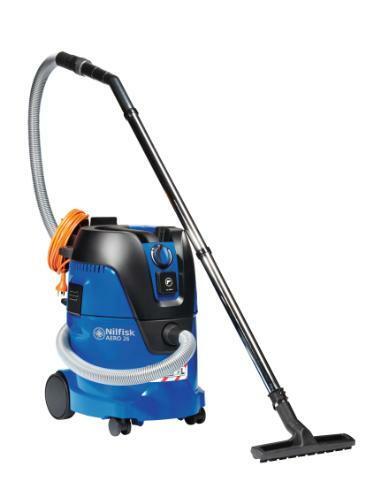 The 25 liter machine has efficient suction performance and is available with optional cable rewind system. Power socket with AutoOnOff is found on (-21) models, which activates the machine by the connected drilling, sanding or cutting tool. The AERO 26 offers great help keeping both air and surroundings clean and reducing the overall sound level. Being compact, light-weight and robust, the AERO wet and dry vacuum cleaner can easily be transported to any location, e.g. by car. After finishing your job, the container can nice and easily be emptied - either by dispose the standard fleece filter bag or tipping the container by the lifting handle. The Push&Clean filter cleaning system prevents loss of performance and increase productivity during the cleaning task. An innovative storage solution makes it easy to place suction hose, nozzles and power cord in several positions and the built-in 2-points tube parking makes operation easy and flexible. AERO 26 is also available with L-class certification with extra suction power and safety features, practical tool compartment and variable speed control - the perfect choice for professionals working with power tools. AERO 26 is compact and easy to use - the ideal choice for smaller cleaning jobs in workshops or at customer sites. It is a light-weight and robust machine for workers within industry, automotive and building & construction featuring ergonomic design, semi-automatic filter cleaning and convenient storage.